There are 2460 posts in this topic. You are on page 35 of 50. This game keeps getting better. So many options to shoot for. Updated code to .98 yesterday. .98 was last week wasnt it? Oh nevermind, You updated, right? Scared me, i thought i missed an instagram update! Doing it today on location. 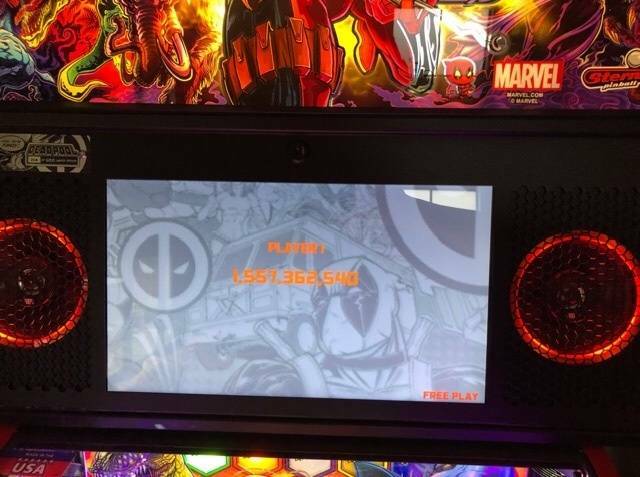 I tens to reset high scores other than GC a few times inbetween updates. May add external sub today. Thinking of selling my LP tecord that came with my LE machine. Should I do it? And when I resell my machine down the road will it hurt the value not having the LP. If you say YES, by how much $$. Hang on to your record. You won't get many dollars for it anyway. Keep it with the game. Those couple of bucks selling it doesn't matter. Cut back on beer for a week or so and you'll have the same amount of money in your pocket vs selling the LP. Has anyone else had a problem with the auto-plunger after the 0.98 update? I installed the update and now it seems that the autoplunger (which I have set to max strength in settings, btw) barely taps the ball most of the time. Sometimes it fires normally (easily sending the ball around to the left orbit as intended), but most of the time, the ball just sits in the shooter lane while the plunger gives it a feeble tap over and over again. Just thought I'd follow up based on the issues I've faced. 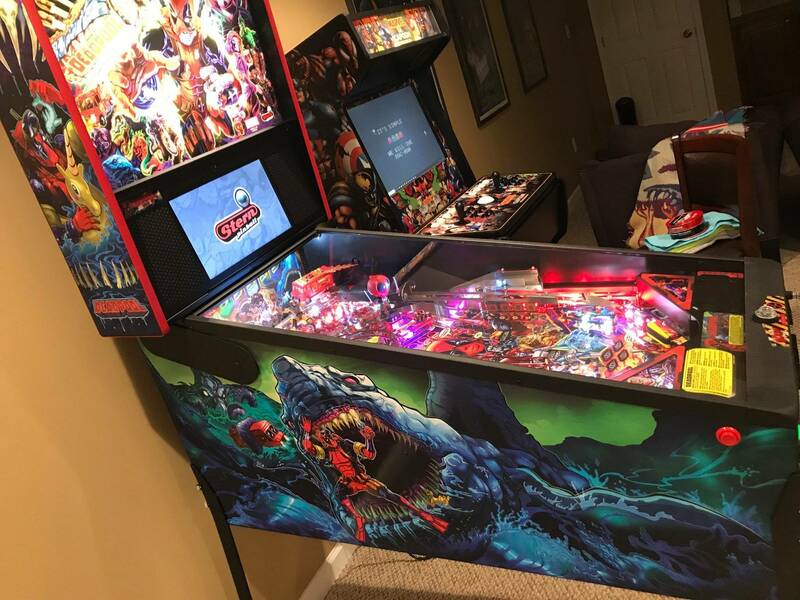 I had a lot of wacky playfield lighting issues, such as the Villians, BOOM lane, and multiplier lights flashing at the wrong times. A new lighting board resolved that. 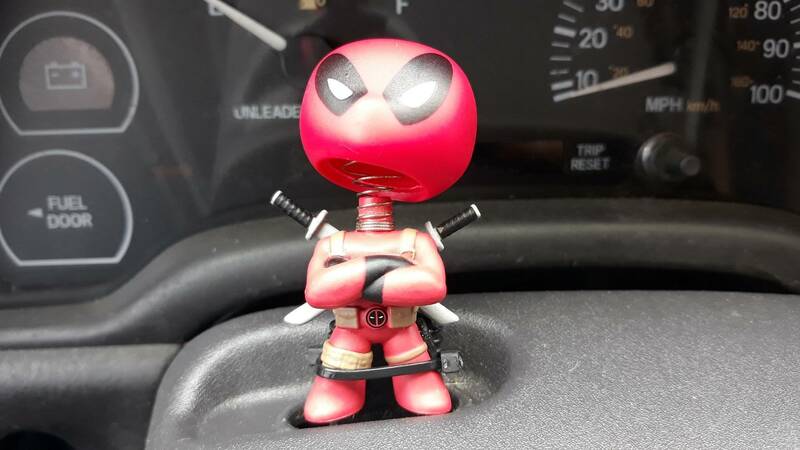 My far right Lil Deadpool drop target refused to stay up. Adding a washer to the mech behind the ledge fixed that right up. My scoop was also spitting out the ball without giving me credit for hitting it. I found that the tiny screw in the switch had fallen out and it was dangling down. Easy fix and all is right. Feels good being back at 100%! Now I just need to retake GC with the new code. I've had some similar lighting issues with my machine as well. Did you need a new node board? I had the same problem with my GOTG. It turned out to be a bad node board. The first thing I would check is the alignment of the auto-plunger prongs. Take a look and make sure they are both making contact with the ball. 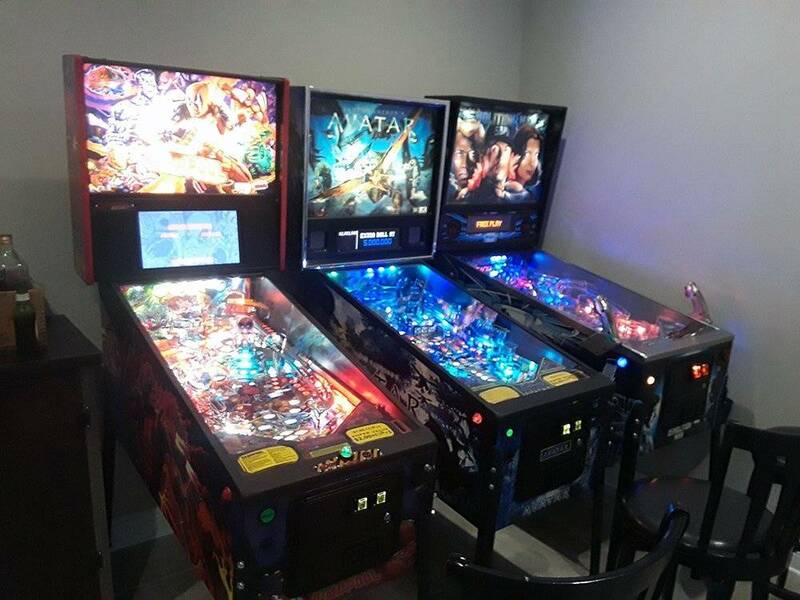 There's usually a little side to side slop when the playfield is in place. 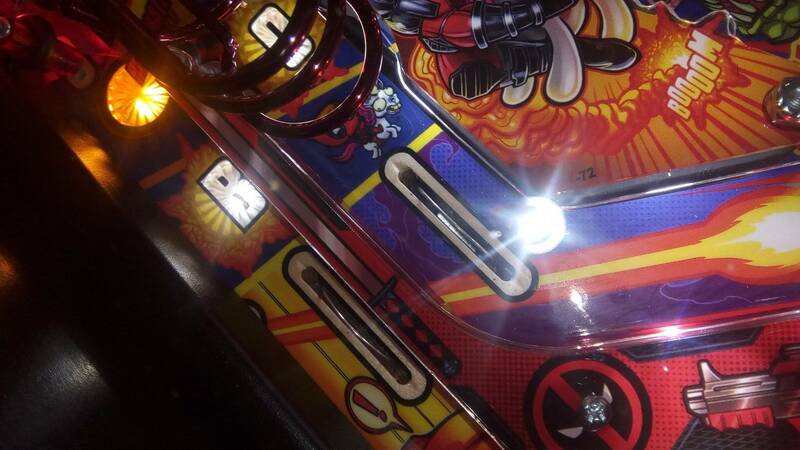 Make sure the ball is centered on the prongs and the shooter rod. Or, you could rip the vinyl to a digital format, upload it to youtube, then you (and us peasants) can listen to it whenever without having to break out the vinyl. wink wink. The (wonderful) guy at Stern called them lighting boards. 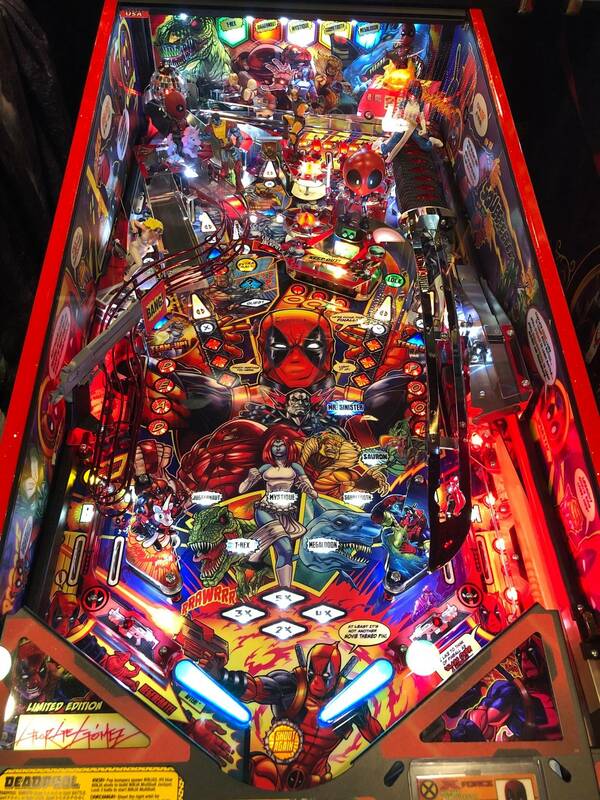 Specifically, they were the boards under the playfield with circuitry and the LEDs in the bottom center (Ball save, x Multipliers, Villains), as well as the right side that lights the POOL targets. just joined the club with a NIB premium. I love the theme so much. 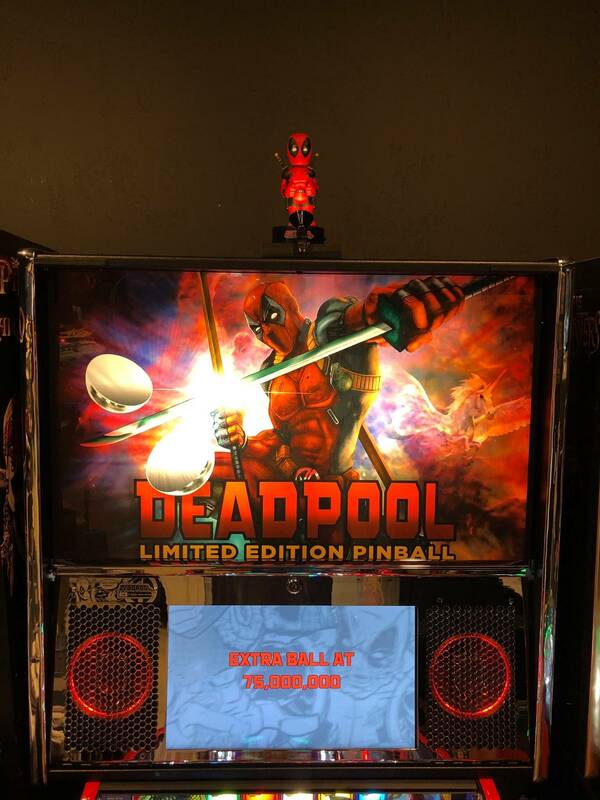 Its my first pin and was down to dialed in or deadpool. The theme really won me over. Im still trying to learn all the rules but am making progress towards breaking 100mil. 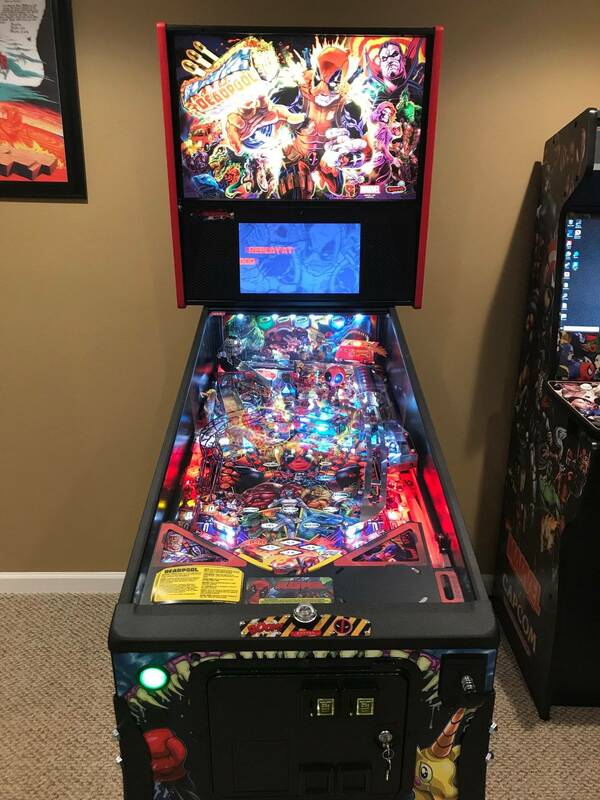 Ive only had it 24 hours and I am somewhat new to pinball. Anyways have been creeping on this thread for a while trying to decide so I appreciate all the comments! 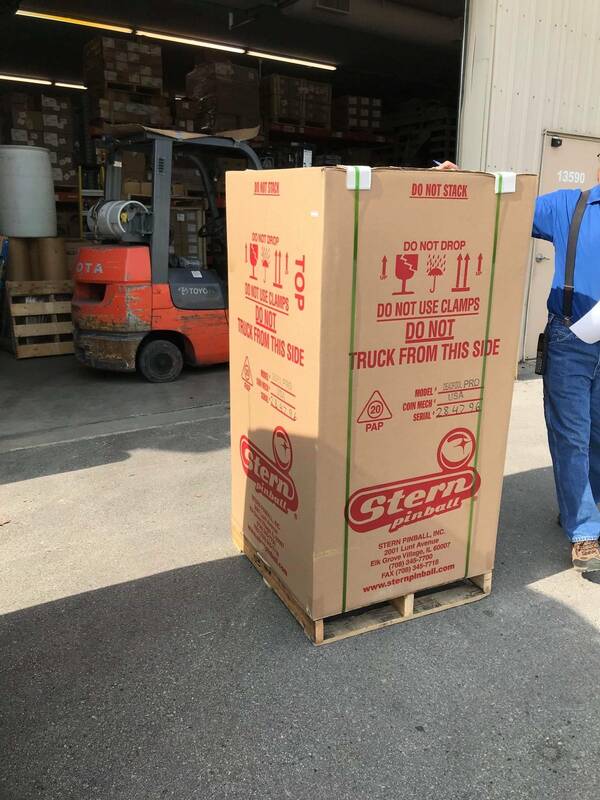 You'll have a ton of fun with that! Man that topper looks so stupid. Can't believe they're charging 400 for it. Ridiculous. Yes... sorta? 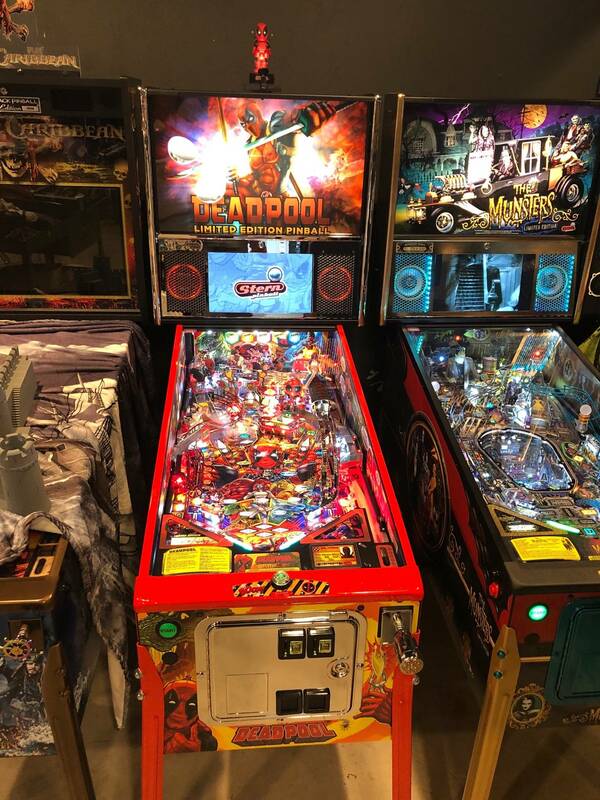 I locked two auto-plunged balls into the Katana back-to-back (more luck than skill, I'm sure) and the 3rd auto-plunged ball came up much more feebly, barely making it into the top-lane section. I have seen this happen at least twice with v.98 now and I'd been wondering if this was intentional to prevent me from locking a 3rd ball into the Katana back-to-back-to-back. I still have problems in the katana blockade when 2 or more players, I loose all accumulated vols when going from one player to another but if playing 1 person alone acts normally. Anyone else has this problem? 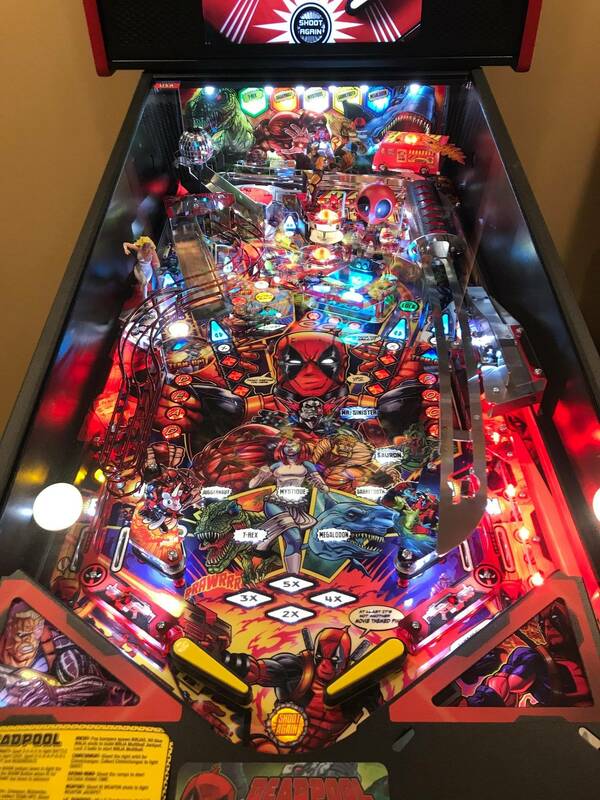 When the ball ricochets off the Snikt target, then goes up the lock ramp, it increases the playfield multiplier and lights the 2x, 3x, 4x, 5x inserts. 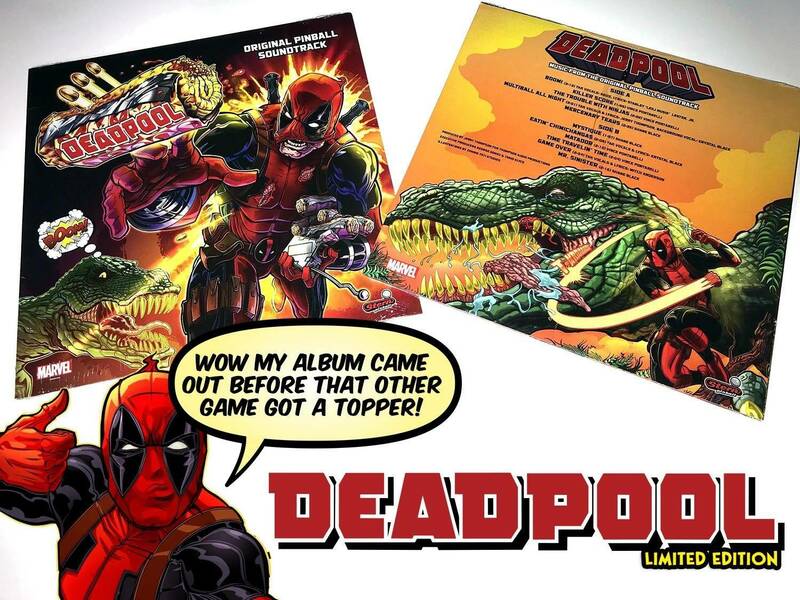 Just had my Deadpool pro delivered this morning. Will take better pics later. Loving it so far. It's such a loud, obnoxious, fun machine. 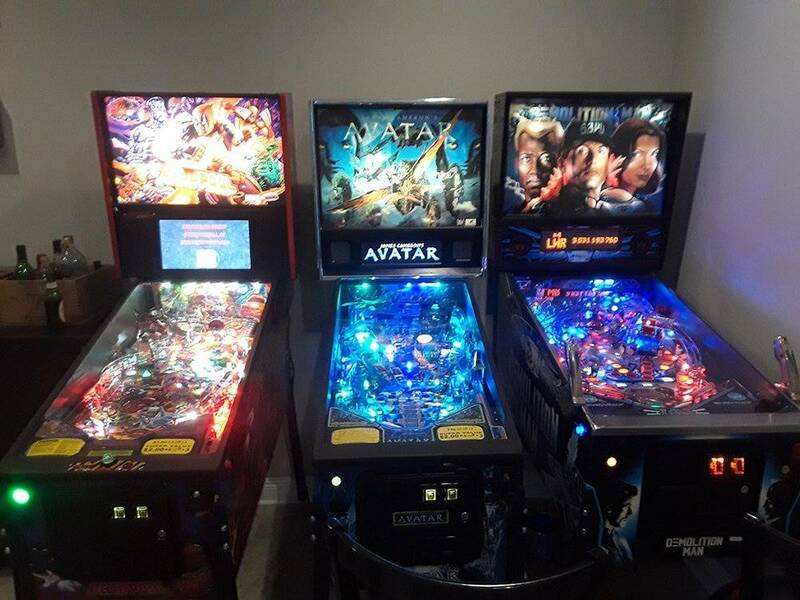 congrats, looks great next to the others. enjoy! Happy Friday, everyone!! Just got my top score on .98 code. 1,557,362,540. Oh, what fun! Wow i'm just near you ) 3 balls, factory settings. 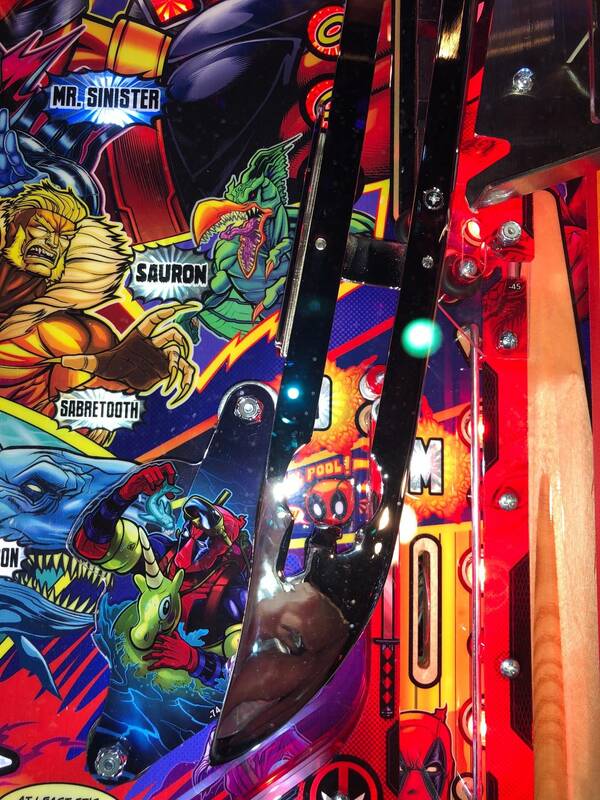 On this pinball, if you want to score high, dont fight anyway, you have so many things else to do. And fight only if you have team up ! Thats the secret !! How are both of you starting and progressing to hit those scores? Im stuck at ~135m. 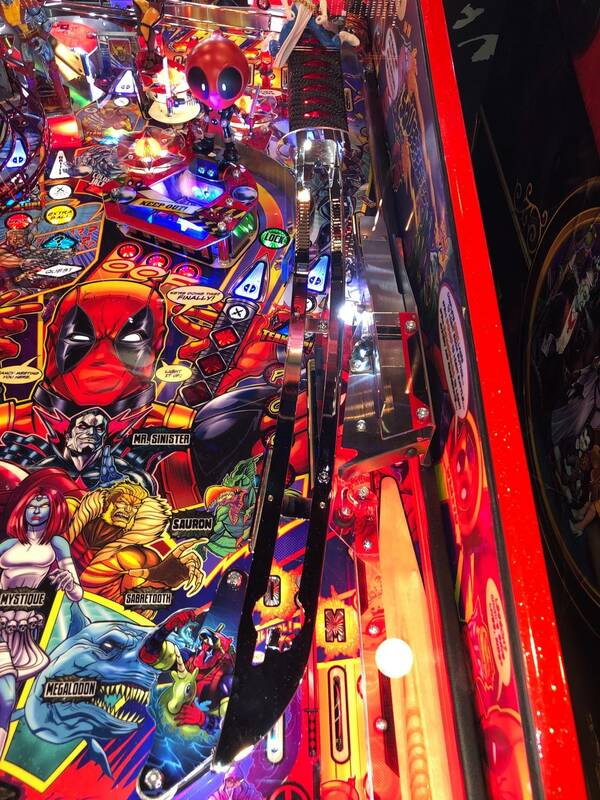 Im finding this pin gets constant side drains which kills any chance of high scores. It came with the black rubber circle off the rod guarding the side drain, but i put them on. I feel like the ball bounces out into that drain even when it shouldnt. I got this mainly due to a great Disco MB, but I did defeat all first round battles, Sauron, and then 2 out of 3 of the battles when Sauron teams up with them. Looking good, DM deserves a colordmd, but I'd do the led version (lcd looked funky to me on it). Shoot the left orbit until disco Multiball starts. You can get 135mm from that alone. On top of that, concentrate on not starting a battle until you have at least 2 team ups ready. I like to try for the two spinner team up and colossus loop. Finishing a battle quickly will net big points. On top of that, keep collecting weapons. 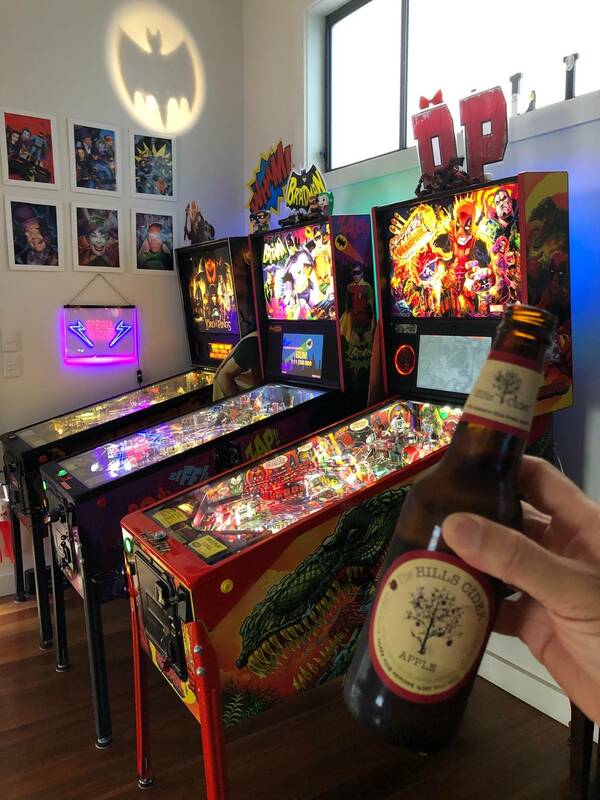 Once you get to 45, mech suit multiball starts. You get lots of points there. Thx! I just got the machine monday and am learning it. Are teamups ready when their life bars are full? Also any tips on the snkkt multiplier shot? 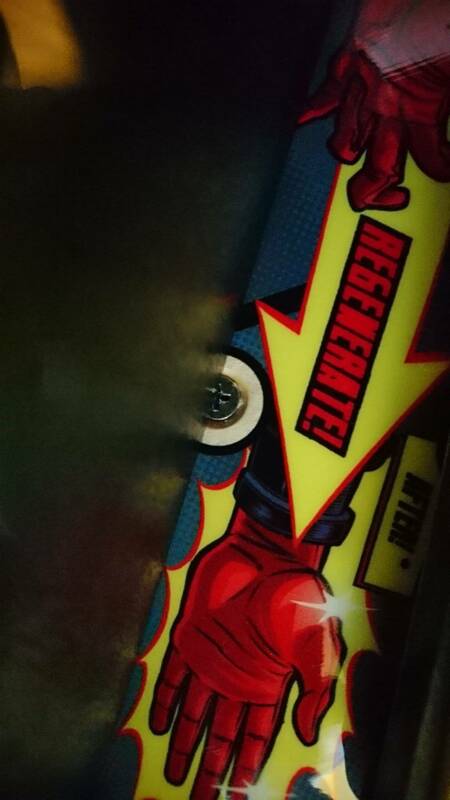 Hit it from the left flipper and hope it banks up the ramp. Haha. Just have to practice. It’s never easy to do consistently. 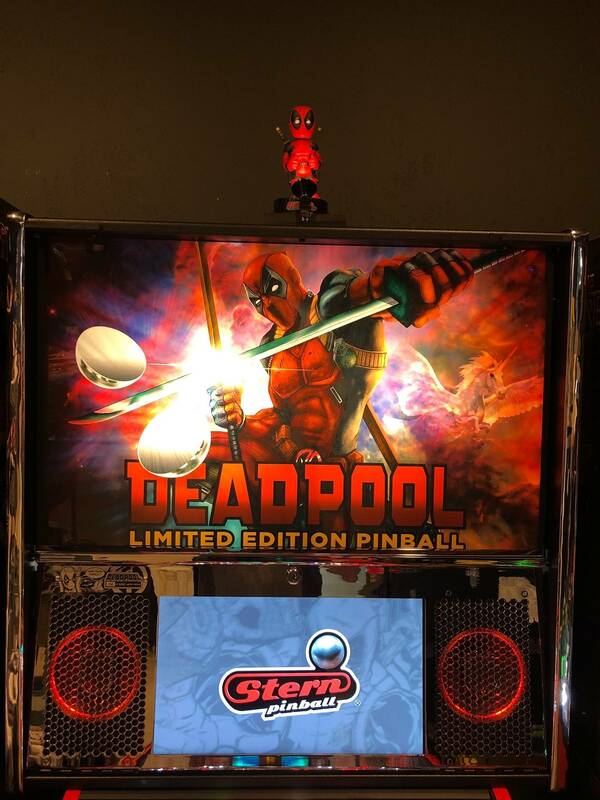 In addition to going for the various multiballs, and Disco and Mech Suit can definitely be big points, I also try to strategically beat the battles quickly by using Lil Deadpool multiball while in battle mode, Team Ups, and/or the Boom button. I think the faster you win the battle (or at least the less damage you have sustained) when you hit the scoop/finishing move, the greater your points. My biggest problem is that I can always seem to hit the scoop until its time for the finishing move and then I often seem to hit everywhere but in it. ha me 2. 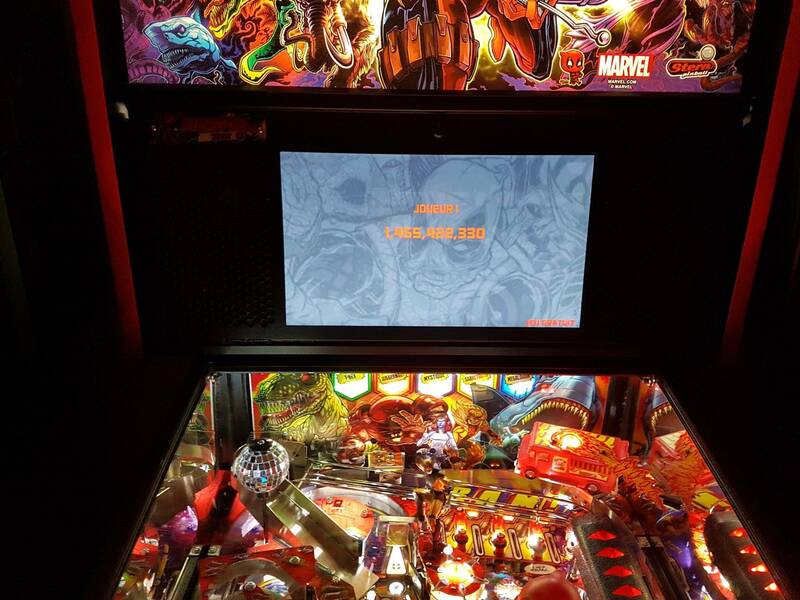 I try to save the easy mini DP multiball for my first battle if possible. Maybe Ill try to do that to start, then go for disco MB. 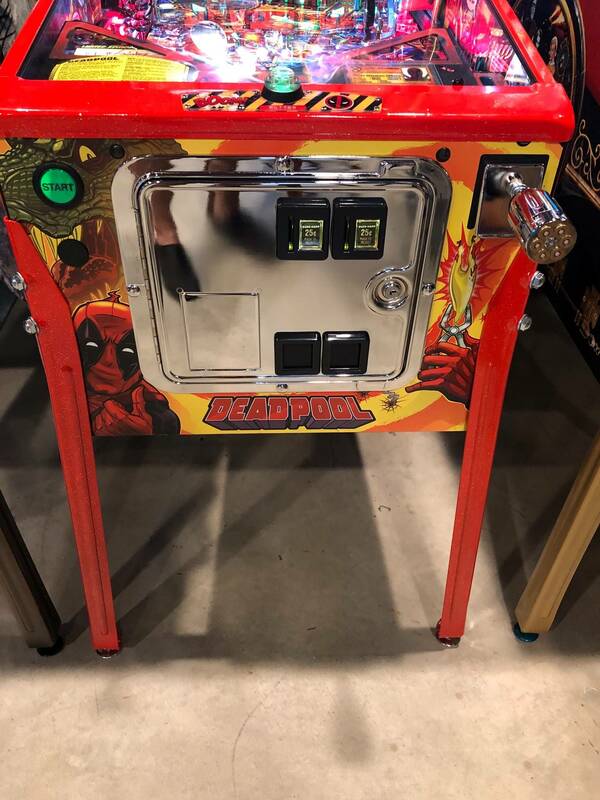 I am new to real pinball and kind of dove in head first buying this machine. Im still trying to get better at passing from right flipper to left safely so I can go for katana multi or snkkt. I am getting frustrated with how many side drains im getting! In case you don't know this already, you can adjust the openings to the outlanes. 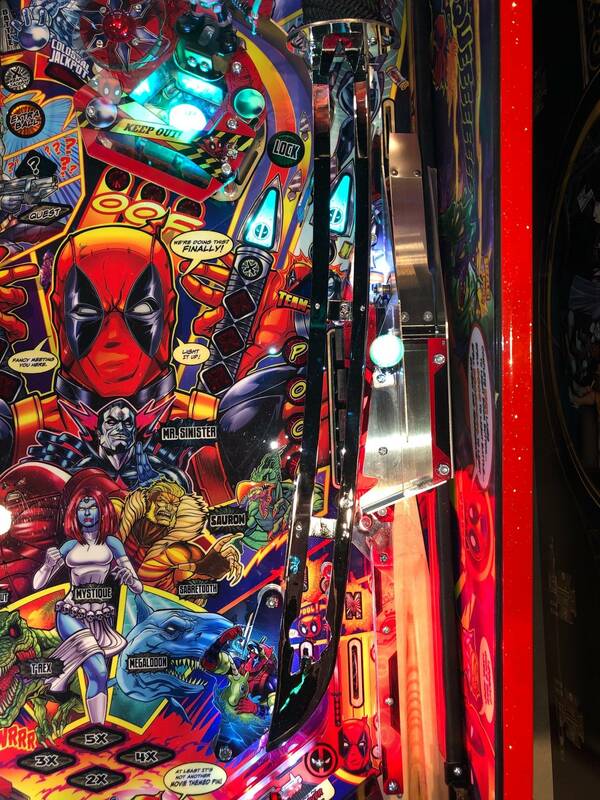 There are three positions for the post on each side that makes the opening a little bigger or smaller (but in pinball those small increments really do make a difference). I have mine set to the middle (I am not a great player, but also have been playing for awhile so I feel like the middle spot is a good spot for me), but if you are new to the game and find you are getting a lot of drains to the sides, you can make the openings smaller by moving the post down. I also find that lighting the Regeneration on the left lane helps too. Overall, I've found my DP to be pretty balanced between outlane drains and SDTM drains (as opposed to other games where the outlanes are drain monsters). 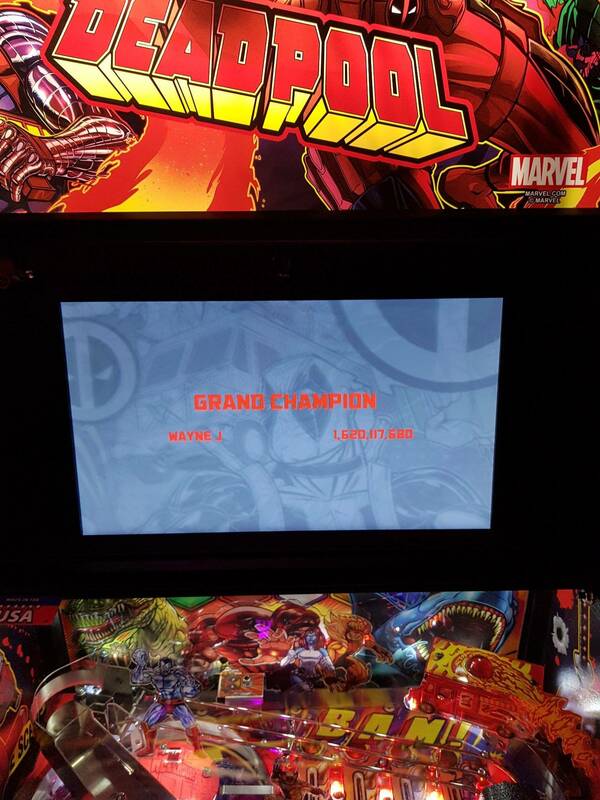 I try to save the easy mini DP multiball for my first battle if possible. Play this on its own. Just use it to collect weapons. Better to play battles in single ball play. Good point on the boom button. If you store 3-4 booms in the button and have lots of teamups, you can get to the final shot scoop just from pressing the boom button. interesting on the post. thanks for that. So regeneration does what? I thought it meant it would revive my ball but it doesnt seem to do that. 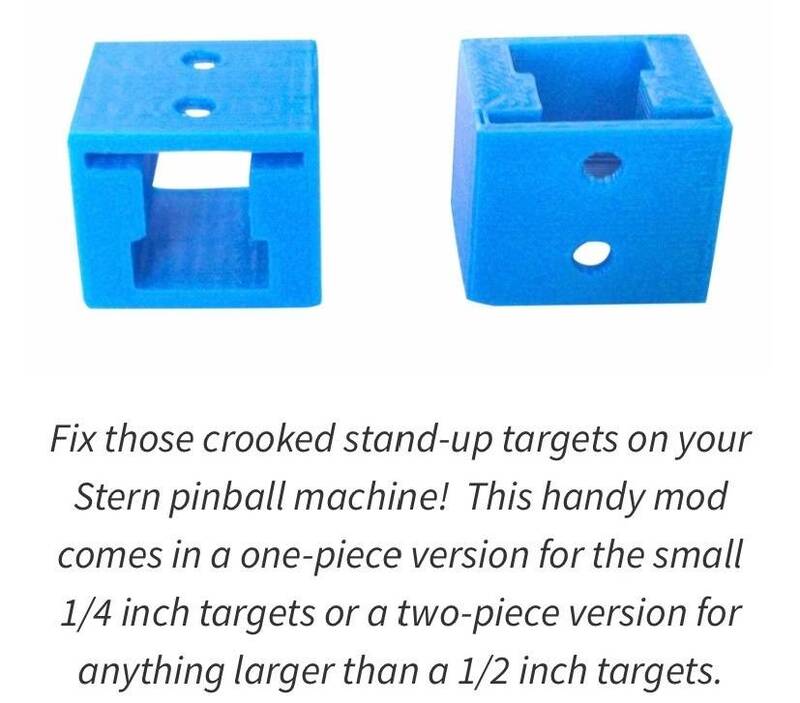 It’s supposed to so you might need to pull up in the metal loop while pushing down gently on the switch under the playfield. This fixed it on my maiden. I seem to remember Not being able to hit the final shot with the boom... Haven’t played the new code much tho. Will tonight! Katana tip - when the ball is coming around the loop, give a Slight nudge to the right as it’s about leave the guide. 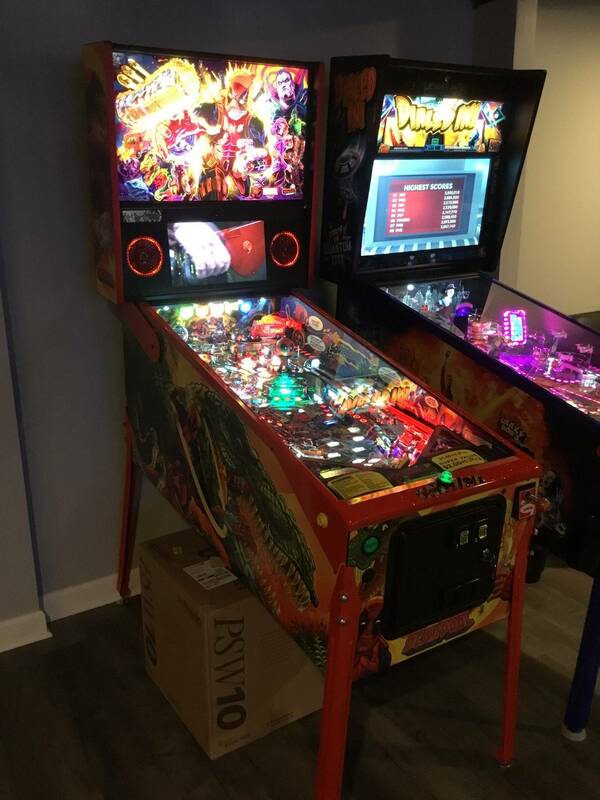 I find one-timers off the left flipper go up the ramp almost 100% with the nudge. Question - Does anyone have any good ways of Stopping the ball when it comes out of the loop? Unless I go for the katana, its always a game of hot potato befor I get control for an important shot - a battle kill for example! Question - Does anyone have any good ways of Stopping the ball when it comes out of the loop? Not to be insulting but make sure the orange regeneration insert is lit. If it’s dark it hasn’t been activated yet and it won’t save the ball. 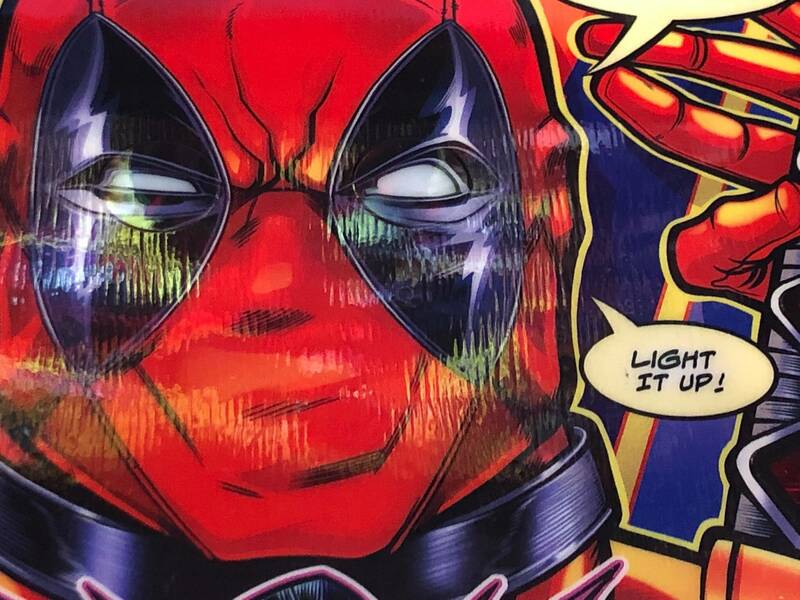 You have to hit all the DEADPOOL targets several times to get that to light up and work. Yup. I understand that part. Im going to install shaker motor later so ill give it a look down there. Great. You said you were new so I didn't want to assume anything, particularly if it meant you didn't need to mess around with the switch, but glad you understand that part. Hope you are able to easily fix the issue. The pops are great, I’ve had a ball get launched up the sknitt a few time - ill take it! Any chance you can post a pic of what you mean by adjusting the side opening?